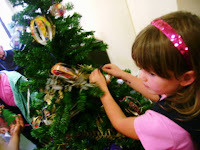 I must confess that I had originally planned to start December with "Twelve Days of Christmas Blogging"... hah! I have hardly made it onto the computer all week, apart from a few snatched moments to read all your blogs and comment here and there! 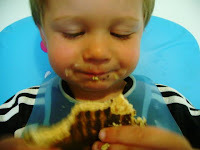 Dash Does "5+ A Day"
Big Brother is the worst one at fruit and vege eating. After tearing our hair out for months (and worrying about lack of nutrition) Mr G and I decided to get tough on Dash. His goal? He must eat the required 5+ A Day of Fruit'n'Veges. I think having a numerical attainable goal like that works well for this chappie. This week found him eating kumara chips, munching on a carrot and downing a corn-cob: previously unheard-of events, bordering on the Miraculous. Drop spoonfuls into a hot frypan with a little light oil; brown on each side; serve and see your fussy child gobble up his veges. 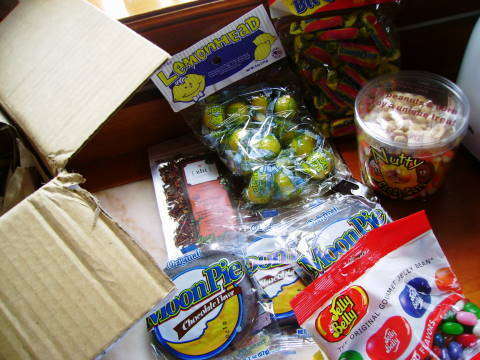 Candy From the Northern Hemisphere! My Great Candy Exchange partner came through! 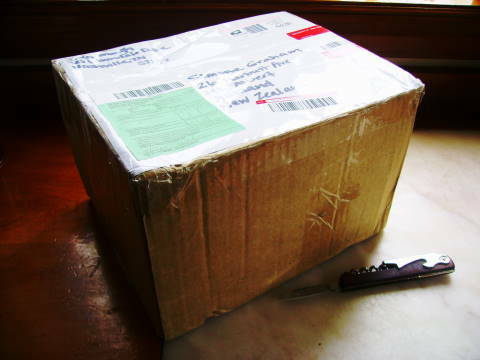 Jenny's shipment of candy arrived all the way from Nashville, Tennessee. 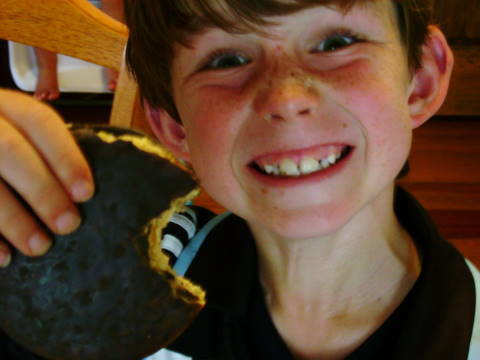 The kids especially like the Moon Pies and gobbled them up. I got a little nibble and thought, Mmmmm, interesting! Kind of marshmallow-y?? The gourmet jelly beans have also disappeared. I am looking forward to trying the Lemonheads (recommended by Jenny) and the fancy tea she sent. I'm going to save the other goodies for the Christmas buildup. I am resisting gutsing them all at once and being very self-controlled because my health kick is starting to pay dividends. That's right - 6kg lost in just under 2 weeks. What the heck was I eating before??? All I know is I feel lighter and so much better. I defy anyone to mistake me for a pregnant woman now! 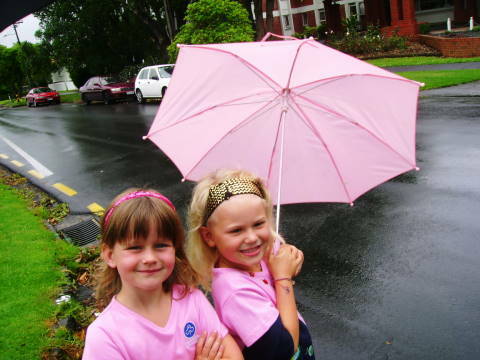 Miss Fab (a.k.a Princess) has joined her friend Yazzy at Pippins (mini-Girl Guides); they wear cute pink t-shirts and sashes with their badges sewn on. "Pippins Care, Pippins Share" they chant. 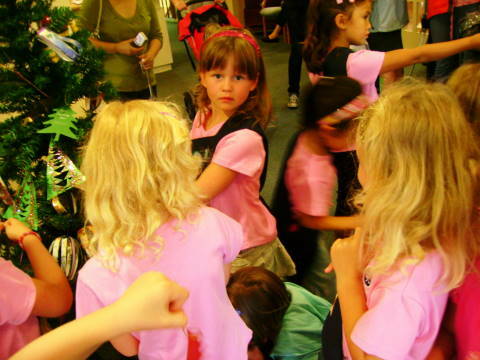 They made Christmas decorations and learned Christmas carols to sing at an Old Folks rest home. 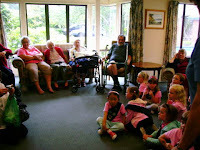 It was very sweet (I was parent help on Wednesday when they took their lovely selves to sing and brighten the Senior Citizens' day). It was a very serious matter though, apparently. My little Starlet is usually very flamboyant; she creates a stage in her bedroom from boxes, turns up her music and boogies. But facing the elderly audience, she didn't crack a single smile. Later, I asked her why not? (and showed her this very somber series of photos). She said, "Well they didn't stand up. It was very hard to get into singing..." Fair enough. 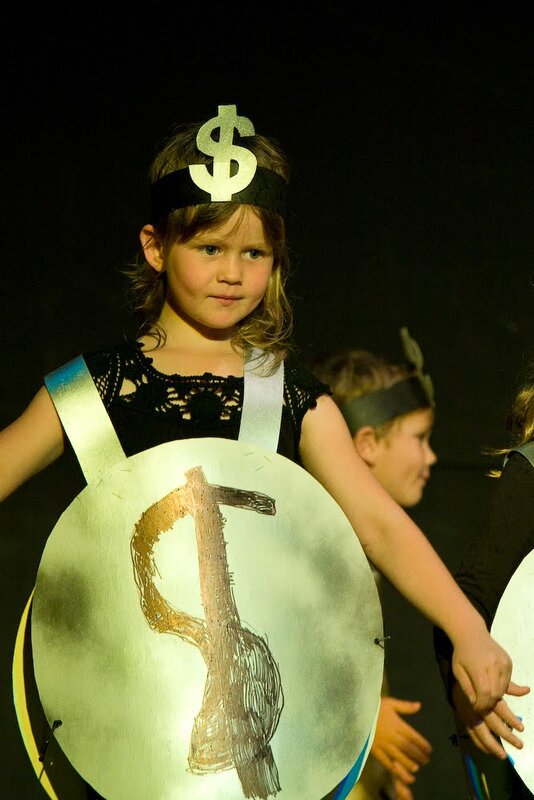 Immediately following the Pippins concert was the end of year Performance show at school. We dashed to the McD's drive through (eek, not good for the health kick), gobbled our burgers and dashed through the rain (yes, it's summer and raining) to the classrooms, a.k.a. dressing rooms. The kids were going mental, crazy, swinging off the rafters almost, so excited were they. 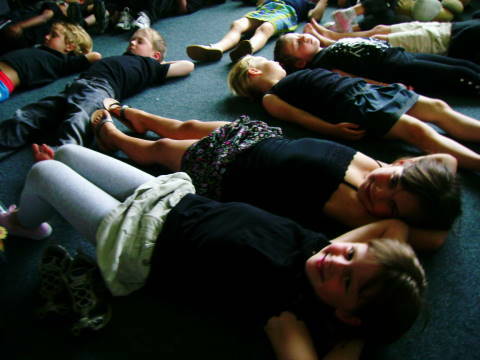 The teacher wisely got them all lying down doing breathing exercises, and order was restored. I had two stars that night: Miss Fab singing and dancing with her class to Abba "Money Money Money" and Dash doing a Rock'n'Roll partner dance (complete with rose, slicked back hair and looking very suave). I was bursting with pride as my girl remembered to smile this time and gave it her all. Dash stunned me. He looked about 10 years old when he came on; I couldn't believe this handsome young gentleman was my freckly lad. I filmed some great footage on the video camera - only to realise to my horror as the performance ended - that I had forgeotten to press record and the camera was on pause throughout. I got nothing. Gutted is how I felt, I tellya. 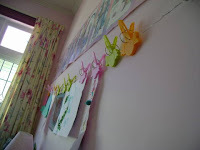 I got some really cool birdie pegs from Sammy, and thought they are just too good for hanging washing - so I put up an art rail in Miss Fab's room. Two hooks and some bendy wire and up goes the artwork; pretty cute dontcha think?? Scrag got a haircut - well, at least 3/4 of one. He "lost it bigtime" as my friend (the brave volunteer hair-cutter) was nearing completion and we had to leave it not quite finished. Just as well he has a cute face. I wrapped more Christmas pressies and stashed them in the cupboard. Only a few left to find. Man I am pleased with myself. The Tree is up, the Wreath adorns the front door. I decided what I really want to be is a writer. And I got an idea for my first book. One day?? ...so, a pretty eventful week, yes? What have your highlights been this week?? Wow, such a busy week, but so full of fun too. Loving those pegs at the end of the post. My youngest is in art production over-drive at the moment and I'm forever looking for new places to display her work. Enjoy your new ear rings too! What an interesting read... and so stink that you didn't record the performance... oh well! We had our school concert on Thursday night and I loved it! Well done on losing 6 kgs... and your self-control with the lollies!!! Where to begin? I've just adored reading all your snippets from your week. I'm going to go back and read your archives as soon as I can. The candy exchange made me laugh out loud...that Gail girl has alot to answer for! Your week looks busy and gorgeous....much like you I suspect. Meredith xo.